Are Agent-Based Models the Future of Macroeconomics? A couple months back, Mark Buchannan wrote an article in which he argued that ABMs might be a productive way of trying to understand the economy. In fact, he went a bit further – he said that ABMs would likely be the future of economics and he warned young economists not to get caught watching the paint dry and to get on board with this new approach to the study. In contrast, he pointed to the failings of the DSGE models that mainstream economists use to understand most economic issues. An AMB is a model environment computer model that is comprised of many individual participants. These actors interact with one another and these interactions produces outcomes – in our case, economic outcomes. These economic outcomes can then be added up to compute GDP and aggregate, investment – any of the economic statistics that we macroeconomists are accustomed to looking at – you could calculate in an ABM. Now, if you are an economist, a macroeconomist in particular, you are probably thinking that so far this sounds very familiar – it sounds like a DSGE model. A DSGE model is populated by many agents and they interact and the results of those interactions produce economic outcomes and we add up those outcomes and we get GDP and so forth so it sounds like ABMs are DSGE models so how are they at all different? Well, there are actually a few important differences. More accurately, it seems to be a combination of three key differences that distinguishes the ABMs. Probably the most important distinguishing feature is that, in an ABM, the interactions are governed by rules of behavior that the modeler simply encodes directly into the system individuals who populate the environment. For example, we could have an ABM with a purely Keynesian consumption rule. We could assume that every time a consumer earns a dollar of income, they spend 20 cents and save the remaining 80 cents. We would make similar behavioral assumptions to govern every possible interaction. We would make these assumptions for consumers, workers, firms, investors, etc. In an ABM, behavior is the point at which a modeler starts making assumptions. People who write down DSGE models don’t do that. Instead, they make assumptions on what people want. They also place assumptions on the constraints people face. Based on the combination of goals and constraints, the behavior is derived. The reason that economists set up their theories this way – by making assumptions about goals and then drawing conclusions about behavior – is that they are following in the central tradition of all of economics, namely that allocations and decisions and choices are guided by self-interest. This goes all the way back to Adam Smith and it’s the organizing philosophy of all economics. Decisions and actions in such an environment are all made with an eye towards achieving some goal or some objective. For consumers this is typically utility maximization – a purely subjective assessment of well-being. For firms, the objective is typically profit maximization. This is exactly where rationality enters into economics. Rationality means that the “agents” that inhabit an economic system make choices based on their own preferences. A second key difference is that the interactions are often restricted to individual (or at least limited) interactions. It could be a limited number of connections between a given consumer and potential sellers. It could be a single connection between a worker and a firm and so on. Lastly, the individuals are “heavy.” That is, the models keep track of each and every individual in the system and the behavior of each and every one matters (to some extent) to determine the outcome. This is again unlike many standard economic systems. In most macroeconomic systems the behavior of a single individual can be altered without having a perceptible impact on the aggregate outcome. This isn’t typically the case in ABMs. In an ABM, one individual can influence the outcome at least to a degree. Now, all of these features have been analyzed in economics. Macroeconomists have models that explore the consequences of matching (or search) in which the individuals make deals on a bilateral basis. In game theory, we often have environments in which each player has a substantial influence on the outcome. And there are well-known models that consider ad hoc rule-of-thumb behavior. However, these modifications are rarely considered in combination. Of the three features, the absence of rationality is the most significant. Ironically, eliminating rational behavior also eliminates an important source of feedback – namely the feedback from the environment to behavior. This type of two-way feedback is prevalent in economics and it’s why equilibria of economic models are often the solutions to fixed-point mappings. Agents make choices based on the features of the economy. The features of the economy in turn depend on the choices of the agents. This gives us a circularity which needs to be resolved in standard models. This circularity is cut in the ABMs however since the choice functions do not depend on the environment. This is somewhat ironic since many of the critics of economics stress such feedback loops as important mechanisms. The absence of rational behavior also means that the ABMs are much easier to solve than traditional models. Once you have settled on your preferred choice functions, you just assemble many such individuals together in a computer environment and simply simulate. In fact, the predecessors of ABMs have been around for quite a while. The earlier versions were called “cellular automata.” The most famous of these was John Conway’s famous “Game of Life.” This “game” took place on a grid (often a torus). Each square on the grid was either on or off (alive or dead). If a cell was alive at time t, it remained alive if 2 or 3 of its eight neighboring squares were also alive. If 1 or 0 of its neighbors was alive then the cell “died” due to isolation. If 4 or more were alive, the cell died due to congestion. Cells could also come to life. An inactive (dead) cell would come to life if it had exactly 3 live neighbors. The environment was very intricate. Starting from a random patter of active/inactive cells, a huge array of outcomes could be supported. There could be bursts of activity followed by a dramatic collapse. In fact, you can get simple versions of cellular automata as apps on your iPhone. Two good ones are SPEED sim, and CA2D. CA2D has many cellular automata rules built in but it doesn’t have the Game of Life. 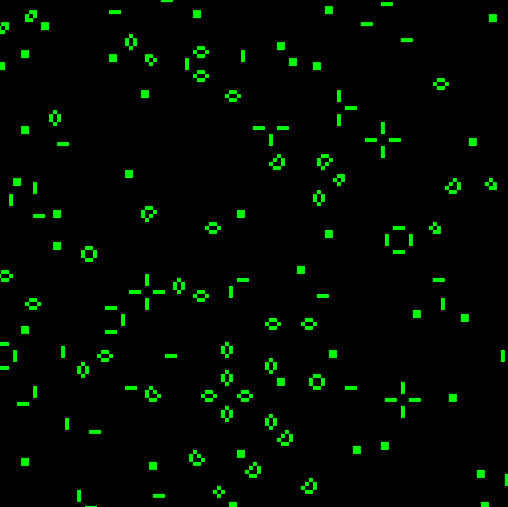 Below are three pictures of Conway’s game of life taken from SPEED sim. The first panel shows an initial purely random starting point. The second panel shows the system after 25 iterations. 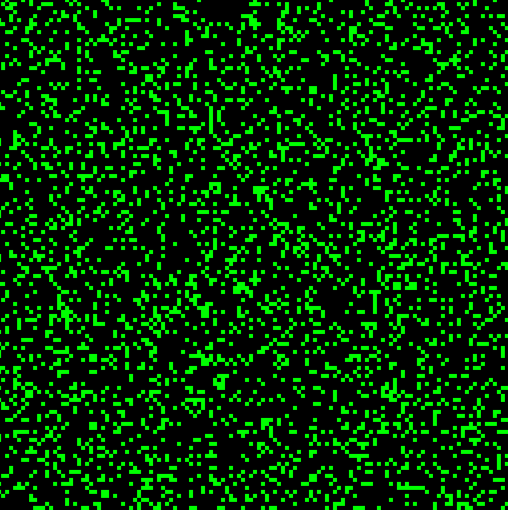 You can see that patterns have emerged “naturally” from the initial random state. The last frame shows the steady state. Clearly even in this simple ABM we can get very complicated patterns and behavior. Whether ABMs have any future in economics is not clear. I suspect that the rule-based approach at the heart of the ABMs will ultimately limit their usefulness – particularly if outcomes depend importantly on subtle differences in specifications of the rules or if individuals have to adhere to simple rules even when the system starts acting wild. Another problem facing the ABMs is that they appear to be suggested as a solution to a problem that might not exist. In their 2009 Nature article, J. Doyne Farmer and Duncan Foley write that DSGE models “assume a perfect world, and by their very nature rule out crises of the type” we experienced in 2007-2008. DSGE models do not “assume a perfect world.” Economists are enthusiastically adding frictions and modifications to DSGE models which incorporate many real-world types of market failures. I will concede that I would be reluctant to offer a particular version of a DSGE model that I felt accurately captured what was going on during the crisis but I don’t think this is because of a limitation of the DSGE approach. It’s a limitation of economists fundamental understanding of financial crises. And that’s not something that ABMs are going to fix …. An attentive reader pointed out that my original description incorrectly described the rules as applying at the system level. This is incorrect. The rules of behavior are attached to the individuals and each can have a different rule. I really enjoy your blog, wish you would write more often! Thanks — I’ll try to post more regularly if I can. I think the bigger problem is getting inference out of those models–figuring out the intuition behind how changes in inputs affect changes in outputs is easier when you ‘see’ (via doing the analytic solutions) what’s going on in between. Thanks for this. I find it very encouraging that you are willing to make real criticisms like this, spelling your concerns out clearly, so that some kind of real discussion can take place. I do think there are lots of ABMs that do NOT in any way overly constrain agents behavior, or make them somehow mechanical and simple minded. The interesting ones allow the agents to learn in sophisticated ways, and outcomes often find these agents evolving their behavior to do clever things in their own interest that the modeller would never have foreseen beforehand. Anyway, I have no time at the moment, but will try to write a positive and constructive post to give some examples in the near future. Good to hear from you Mark — I look forward to your post. I’m not a big fan of ABM, but “eliminating rationality” doesn’t eliminate feedback from the environment. What nonsense. I’m glad to see some economists even talking about ABM. Usually when I bring it up, the reply I get is “Oh, we tried that 20 years ago and it didn’t work.” But I’ve been following the recent efforts of Buchanan, Farmer, Tesfatsion, (Neil) Johnson, and others, and I think a lot of interesting things are beginning to happen with ABMs in economics. I’m not very familiar with DSGE models, so I can’t speak to that subject; however, I would characterize the agents in an ABM slightly differently than you have. It is true that “In an ABM, behavior is the point at which a modeler starts making assumptions.” However it is subtly incorrect to say “the interactions are governed by rules of behavior that the modeler simply encodes directly into the system.” In my experience these rules of behavior are encoded into the individual agents, not the system. That is, an ABM makes assumptions about agent-level attributes and rules, not system-level attributes and rules. Thus, as these simulated agents are analogues for real-world people, they are capable of acting upon desires and constraints in the same way that real people act upon desires and constraints. The two key characteristics of ABMs, then, would be that: 1) the system-level patterns emerge as a result of these thousands of individual interactions. (Josh Epstein calls these “generative” models, since the system-level behavior is generated by the actions of the agents.) And 2) the agents of the simulated system can be represented both explicitly and heterogeneously – that is, they don’t all have to have the same rules, attributes, constraints, or current states. The outcome of these two characteristics is that an ABM can easily represent non-linear behavior, especially as it relates to spatial and temporal heterogeneities and far-from-equilibrium dynamics. Also, a neat consequence of these features is that the emergent patterns of system-level behavior can be compared to patterns we see in the real world. And the quality of that comparison can give us some idea if our agent-level assumptions are correct. In ecology Volker Grimm calls this “pattern-oriented modeling;” but it applies equally as well to economic systems. BTW – I’ve just had a look and I see that you are at the University of Michigan. You’re very lucky! U of M has one of the premier centers for the study of complex systems in the world, and a lot of great researchers there. (I’m sure they’d be glad to tell you that feedbacks, far from being minimized in an ABM, are actually crucial to the emergence and stability of system-level patterns!) Cheers. Hi Ted — thanks for the comment. You’re right — I should have been more careful in my writing. I *meant* to say that the rules are applied specifically to the individuals. I’ve corrected the post accordingly. Similar to Ted, I do not believe the “differences” you’re talking about are accurate. A DSGE is merely a special case of ABMs. You can parameterize any canonical economic model into an ABM framework and achieve identical results. To say “This circularity is cut in the ABMs however since the choice functions do not depend on the environment.” is also very incorrect. Environmental feedback and sensing is a primary feature of contemporary ABMs. Conway’s Game of Life is a special case in which that does not happen. But you can have an agent consider any sort of inputs through any set of channels that you wish. Pingback: Complex Insight | Are Agent-Based Models the Future of Macroeconomics? First, agents in ABMs can be as rational (or irrational) as their real-world counterparts. They can be forward looking intertemporal optimizers, or they can be reinforcement learners, or they can follow simple “standard operating procedures,” whatever. However, whatever they do, they must do it themselves. Second, ABM researchers seek to understand how economic systems might (or might not) attain equilibrium states, with equilibrium thus studied as a testable hypothesis (in conjunction with basins of attraction) rather than as an a priori maintained hypothesis. What science does otherwise? Thanks for the comment. It sounds like you put a lot more emphasis on whether the interactions in the model take place at an individual level. I’m curious as to whether you would think that search models of the Diamond-Mortensen-Pissarides variety are agent-based models. On the issue of whether equilibrium states are attained — in most economic models an “equilibrium” is simply a solution for the system. It isn’t a rest point necessarily. Using that terminology, an ABM is automatically always in equilibrium. “Equilibrium” really just means “model prediction” in economics. The main point of disagreement, I think, is “market clearing” which is an assumption in many, though not all non-ABMs. New Keynesian models for example, are not ABMs but do not assume market clearing. In order to produce a unique prediction they do impose some top-down assumptions though, such as assuming that the economy returns to a predetermined steady state, and assuming a “symmetric equilibrium” in which all agents with the identical characteristics make identical choices. Without these, the NK model has no unique predictions. I wonder how ABMs deal with such situations? Are ABMs able to identify multiple predictions from the same set of assumptions? How does that work? Leigh Tesfatsion, “Structure, Behavior, and Market Power in an Evolutionary Labor Market with Adaptive Search” (pdf,295KB), Journal of Economic Dynamics and Control 25 (2001), pp. 419-457. I believe the above paper is one of the only papers I have seen in economics to date that permits economic agents to talk back and forth with each other at event-triggered times using event-triggered messages (in order to implement a Gale-Shapley deferred acceptance matching process). The reason “equilibrium” in many economic models equates with “solution” is because many economists build equilibrium conditions (e.g., market clearing conditions) into their systems of equations, not because equilibrium means the same thing as solution. I would argue that search and matching models are agent-based but not simulation based. Let me distinguish between agent-based models and “Agent-Based” models. Almost all models that satisfy the Lucas critique are agent-based. However, “Agent-Based” models typically use simulations to analyze outcomes. The kinds of features that Agent-Based modelers wish to simulate is up to them. Some modelers might choose to simulate utility-maximizing, perfectly rational agents with a Walrasian auctioneer determining the prices of all goods, all services, and all possible contingent contracts at the start of time. These models will pretty much replicate the kind of stuff you would get in a typical old-fashioned RBC model. And since that kind of a model has a convenient analytical solution, Agent-Based modelling is needless overkill. Other Agent-Based modelers might choose to relax some or all of those assumptions in various ways. While DSGE models exist where those assumptions have been relaxed (to various limited extents), the simulation (Agent-Based) technique now becomes more attractive and more informative for modelers working with numerous policy experiments to study non-equilibrium dynamics (or since you define everything as an equilibrium, non-fixed point dynamics). In my view, there isn’t much of a difference between DSGE and ABM except for the fact that the latter allows more flexibility and is more easily applicable to ‘mathematically intractable’ problems since it uses simulations rather than analytical solutions. As someone with an engineering background prior to my DSGE-based Ph.D., I prefer the simulations approach because it allows easy access to greater realism (in terms of heterogeneity, localized markets and expectations, potentially ‘uncleared’ markets, etc.) 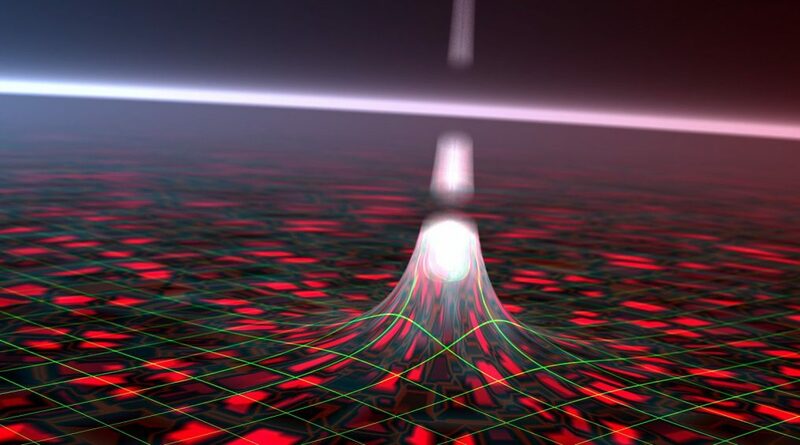 and non-fixed point dynamics. Typically, I write my model first and then think – what solution technique works best for this? Should I simulate or solve? When I choose the former, I am doing ABM, and when I choose the latter I am doing DSGE. As a quick aside, the use of Simulated Method of Moments to parameterize DSGE is not the same as simulating all the agents directly. The SMM technique simulates the model (i.e. simulates the assumed stochastic process and evaluates the model analytically) whereas the “ABM” technique simulates the agents themselves. I respectfully disagree with the above comment. As detailed in the following working paper, a key difference between agent-based macroeconomic modeling and DSGE modeling is that the decision-makers in agent-based macro models are required to implement **locally constructive** decision procedures, without recourse to externally-imposed global coordination conditions (e.g., all markets continuously clear all the time due to a modeler-imposed set of market clearing conditions). ◦Ekaterina Sinitskaya and Leigh Tesfatsion, “Macroeconomies as Constructively Rational Games” (pdf,1.2MB), Working Paper No. 14018, Economics Department, Iowa State University, August 2014. First and foremost, Leigh, I want to thank you profusely. I make extensive use of your website and all its extremely valuable resources for research and teaching (at the undergraduate upper-class level). The second volume of the Computational Economics handbook you edited has also been immensely useful for research and teaching. Thank you, again! I really should not argue with a towering authority as yourself, but I tend to see ABM and DSGE as occupying a continuum. While I agree that the true potential of ABM is realized in models where only localized rules are employed (and all prominent papers do follow this paradigm), I, personally, am willing to call a model “Agent-Based” even if some non-central elements are constructed from global ‘equilibrium’ conditions for the sake of parsimony. To me, the use of simulations is the key differentiator, but I can see why an advocate of ABM would prefer to have a more fundamental differentiator in the form of solely localized events leading to macrodynamics. The following are top 6 – 10 hottest girls in video games. You can play a wide variety of games on a computer or on a console. It seems like every day a different gadget is being made released to the masses. Why wouldn’t the rules built into the agent depend on the current state of the market etc? It is not that hard to do that in the simulations.